Our 2nd blog email is going out just as we’re about to celebrate our Golden Wedding Anniversary. 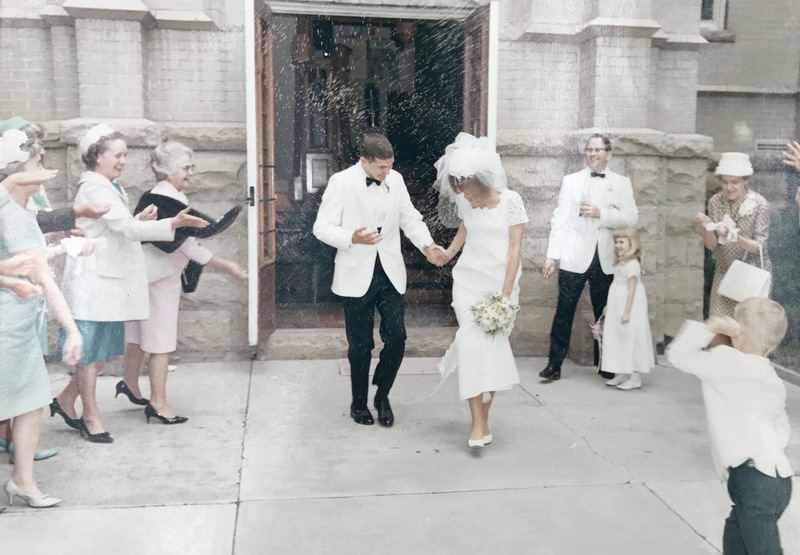 The whole family is off to Colorado on Saturday to get introduced or re-introduced to my beautiful home state where we got hitched 50 years ago. Unfortunately, the Presbyterian church where we were married was torn down shortly thereafter. An inauspicious event. Before I blog-on about recipes, let me tell you about our new page feature (see menu at the top) – Food for Thought. In Food for Thought we’re posting articles that we’ve really enjoyed and found thought-provoking – and sometimes just provoking. We promise to stay far far away from politics – unless/maybe/if/possibly it relates to food. Our first article is about why today’s poultry is so flavorless. I’ve been griping about that for years. Now back to our blog: Two weeks ago I couldn’t stop thinking about Curry. Go GG Warriors! Now I have another obsession – it’s rice. RICE. Maybe it’s because I was looking through old wedding photos and found this one. 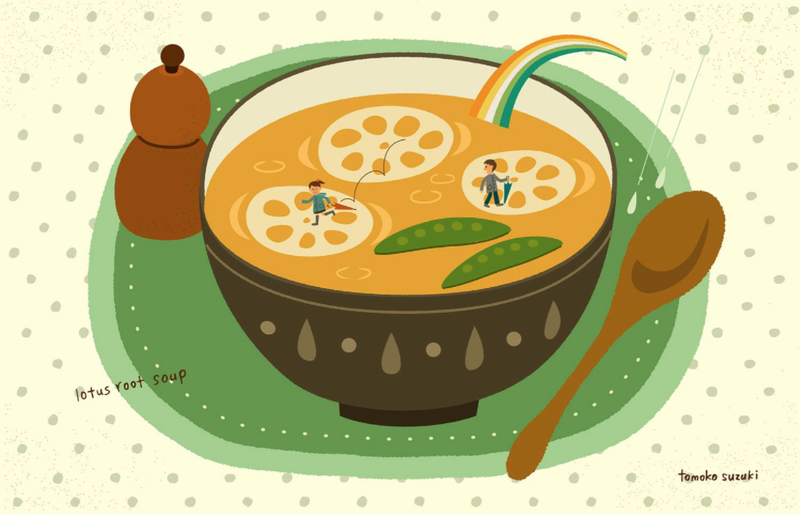 There we were, 50 years ago, starting our life adventure together – and being bombarded with rice. For fertility? For wealth? Apparently, Ann Landers said that we were just killing birds by that old custom, but that belief has been discredited. Some of my FCHS Besties will recognize two very special mothers in that photo, and our Chino relations will see special family members. You’ll almost always find a container of cooked rice in our refrigerator. And, might I add that those glass containers – any kind of snap on, as long as they can go in the microwave and in the oven – are our absolute favorite things for food storage. 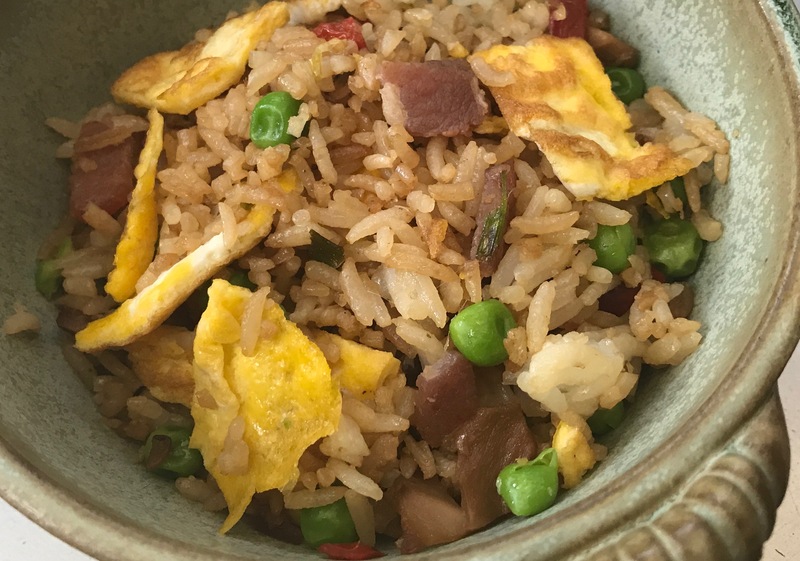 This morning we used our leftover (and chilled) rice to fix a delicious breakfast; we call the recipe Breakfast-Lunch-Dinner Fried Rice. And what else, you ask, should we do with cold rice? 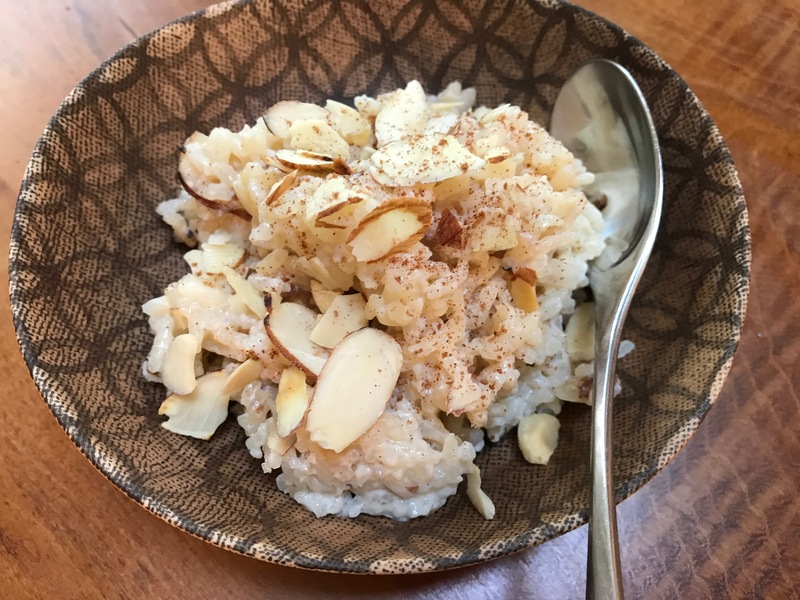 You can make Mystery Mix Rice Salad or our slightly sweet Rice Pudding, which is delicious for both breakfast and dessert. Recipes are included. Rice re-heated with a huge dab of butter tastes good any time and with almost anything. Put a damp paper towel over the rice and heat briefly in the microwave. Or use your homemade chicken broth with some rice added for the beginning of a simple and fast soup. Stuff some peppers with a rice mixture (we’ll post a recipe at a later date) and bake. Serve our Chile Verde over rice, if you’re not in the mood for tacos. And let’s talk about rice before it’s stored in the refrigerator. 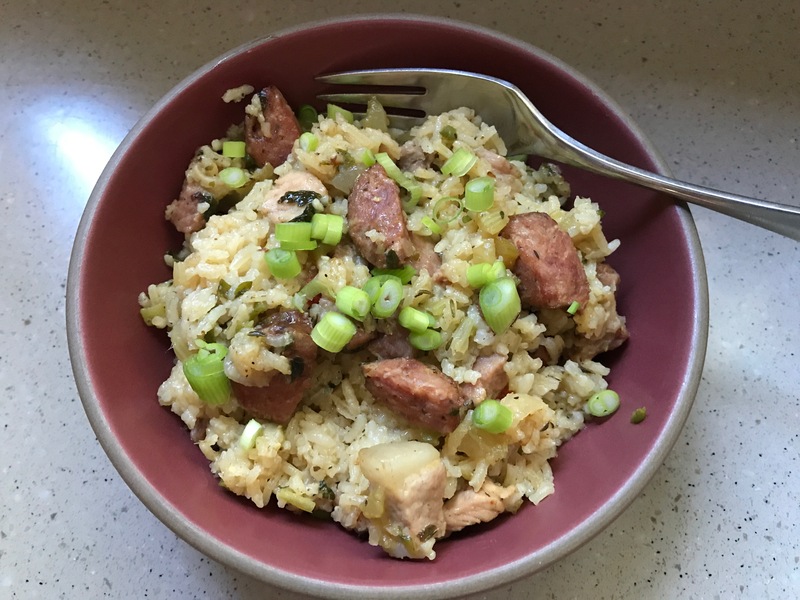 Specifically, let’s talk about jambalaya! I’ve got to get our Louisiana connection in here sooner rather than later. I must have 5 recipes for jambalaya tucked away in my recipe drawer. I did a little revising and came up with something very do-able for just one or two, especially since it will be even better the second or third day – and can even be frozen. I think it’s easiest to do the jambalaya in the oven, but most recipes will have you cook it on the stove. about 8 shiitake mushrooms (either packaged dried ones or fresh ones), sliced (if dried, rehydrate in very hot water for 15-20 min and then squish them until dry between paper towels) – the shiitakes are optional, but we like them in it! about 1 c of leftover meat cut into 1/2″ cubes, if you wish; or dice 4 slices of bacon and fry ahead of time to add, if you don’t have leftovers. Or omit totally. Heat a wok or a large skillet to medium high heat. Add the oil. When the oil is hot pour in the eggs and swirl the pan so that the egg forms a large thin pancake-y-like thing. Gently lift the edge of the eggs so that any uncooked egg runs to the center. When the egg mixture is set, turn it out of the pan and onto a cutting board. Cool; and then cut into 1″ pieces. Add the remaining oil to the pan and bring it back to medium high heat. Then add the green onions and mushrooms and stir fry for about a minute. Add the garlic, chile, ginger and stir fry another 30 seconds or so. Then – being sure that your pan is still at medium high heat, cause you want the rice to sizzle – add the soy sauce, sesame oil, and rice. Stir fry for about 2 minutes, then add the meat and stir fry for another minute or two. Add the peas and egg and gently incorporate them into the rice mixture until they are heated. Serve. Leftovers will be wonderful warmed up in the microwave (a damp paper towel on top works well) – maybe for lunch? maybe for dinner! This is all about improvising; our Albuquerque friend David will approve. I like crispness so add chopped red cabbage. If you have leftover lentils, you could replace the rice with the lentils. Add avocado if you have one. Vary the beans. The sky is the limit. Put the cauliflower into a food processor and process until it resembles rice. (This is actually really fun and different, but it’s a step you can easily omit – and instead just chop up the cauliflower into small pieces). Put the cooked rice in a large bowl and add the cauliflower and cabbage. On a cutting board, mince the onion and chop the cilantro finely. Then mix the onion, cilantro and jalapeno into the cauliflower and bean mixture. Salt and pepper the mixture to taste. Carefully mix in the cheddar cheese and avocado. In a separate bowl, whisk together all of the dressing ingredients. Pour about 1/2 of the dressing over the rice mixture. Taste and then add more dressing, as desired (the rest will keep well). 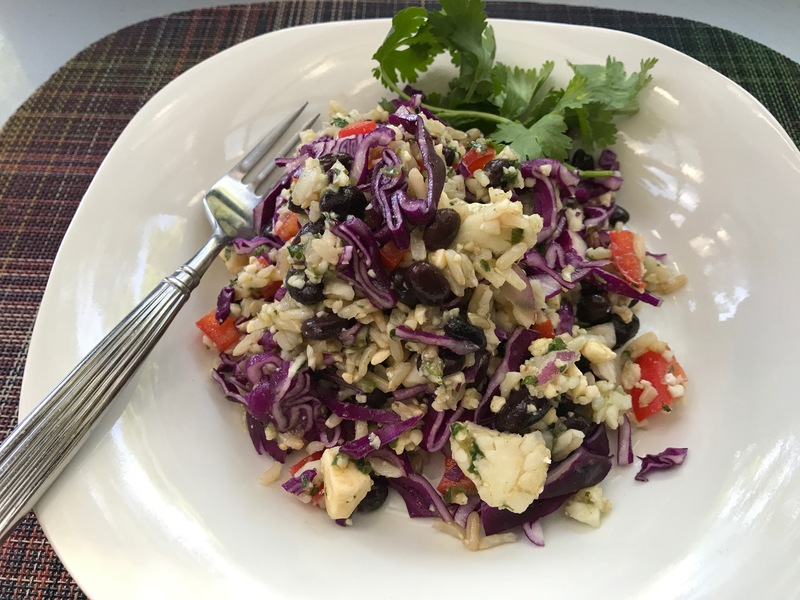 The salad is great right after you make it and will keep well in the frig for several days (but don’t put the avocado in if you don’t intend to use the salad immediately). Adding a little more salad dressing when you use the leftovers will perk everything up. This can be improvised many ways too. Use coconut milk instead of cow’s milk. Vary the spices (a pinch of ground cardamon is nice) or the nuts (try chopped cashews). Add more or less brown sugar. Serve it with raisins or cooked rhubarb or raspberries or more nuts. Have it for breakfast or dessert. Have it warmed or chilled. Double the recipe if you want it to serve more or last longer. Put the rice and milk in a medium saucepan and bring to a boil. Turn the heat down to a simmer (barely simmering); add the brown sugar, cinnamon, salt, and 1/2 the almonds. Simmer uncovered until almost all of the liquid has been absorbed. Top with the rest of the almonds – and enjoy. As with so many recipes we’ve suggested, be creative. Add cut up chicken instead of the pork; add ham, diced; or maybe add some peeled shrimp the last 5 minutes of cooking. If you want it spicier, mince and add 1 or 2 teaspoons of minced Fresno or jalapeno chile. To keep it somewhat authentic, be sure to always use the bell pepper, celery, onion, and garlic. 1 tsp Tony Chachere’s Creole seasoning – or another Creole/Cajun seasoning, if you have one. You might substitute some chili powder, if you can’t get Cajun seasoning. We often use Gebhardt’s when we’re needing chili (not chile) powder. Heat 2 T of the oil in an oven-worthy deep pan (cast iron is great; Staub or Le Creuset work well too) to medium to medium-high heat. Add the sausage and saute until it’s lightly browned and the fat has been rendered. Drain off the accumulated fat; remove the andouille from the pan. Add the remaining oil and the 1 T butter and bring the pan back up to medium high heat. Add the pork, sprinkle with salt, and fry, stirring occasionally, until it’s beginning to brown. Add the bell pepper, onion, celery, garlic and all of the seasonings and continue cooking over medium heat until the vegetables are soft. Add the rice and chicken broth to the mixture and bring it all to a boil. Put the lid on the pan and place the pan in the pre-heated oven. Bake – without taking off the lid – for 30 minutes, then check. If the rice has not yet absorbed all the liquid, put it back in the oven for another 5-10 minutes. Then remove the pan from the oven and very, very gently lift and mix the jambalaya, just to fluff. Replace the lid and let it sit for 10 minutes before serving. First, happy anniversary! What a fabulous photo of you two on your wedding day! Second, what brand(s) of the glass storage containers do you use? And third, Charlie has had good luck making jambalaya in his biggest (yes, he has multiples) rice cooker. Having leftovers of that in the freezer is like money in the bank! We like Glasslock – but you have to be sure they’re oven safe. Not all are. https://www.amazon.com/Glasslock-18-Piece-Assorted-Oven-Container/dp/B00LN810PM. Tell Charlie we need to know his jambalaya rice cooker technique. Sounds like a winner. And we need Best of the Besties recipe ideas!